Far Rockaway, NY - Sunday marked Achiezer's first ever CIMBY 5K Men's Run, which featured runners from across the community participating in an invigorating 5K Run on the scenic Far Rockaway boardwalk - all in support of the important new "Chesed In My Backyard" or "CIMBY," initiative, which encourages people to proactively engage in acts of kindness. The support shown by members of the community exceeded all expectations and shed light on the true might of kindness as nearly 90 runners and over 300 community members joined in the day's festivities. The event was a triumph, fueled by generosity and goodwill and successfully provided an opportunity for community members to unite on behalf of those in need. "To me, the Siyata Dishmaya of the weather factor was beyond amazing!" remarked Yitzchok Saftlas, participant and CEO of Bottom Line Marketing Group. "A clear blue sky was on the horizon from the start of the race through the BBQ. Only after the crowd thinned did the clouds show up with the heavy rains that followed. Unbelievable!" With loud cheers from friends and family runners pushed themselves to the finish line. Following the run, participants were greeted by a savory BBQ gala sponsored by Traditions Eatery and enjoyed an entertaining live concert by Evan Al and Khroma, featuring Aryeh Kuntsler, Nochi Krohn and more. 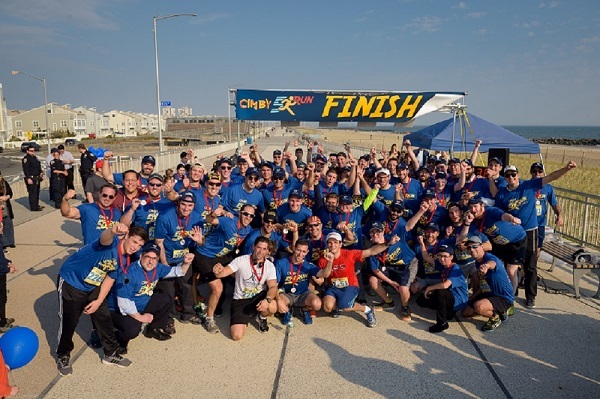 "In all my years of participating in Rockaway races, I've never seen a 5K like Achiezer's CIMBY 5K," declared Assemblyman Phillip Goldfeder. "A huge thanks to the sponsors and runners!" A heartfelt thank you is extended to the generous sponsors and running committee for making this event a smashing success. The event was made possible with the help of Assemblyman Phil Goldfeder, Boulevard Riverside Chapels, Carlos & Gabby's, Fame, Five Towns Plastic Surgery, Fruit Platters and More, Gourmet Glatt, J. Wasser & Co., Judaica Plus, Moshe Majeski, NYPD Community Affairs, NYPD's 100th Precinct, The Paper Place, The Party Source, PEYD, RL Hatzalah, Rockaway Nassau Safety Patrol, South Nassau Communities Hospital, Traditions Eatery, and Westwood Realty Associates.